My favorite liberty quotes are by Robert G. Ingersoll because he eloquently expresses my core belief about liberty — nothing is more important! I’m a big fan of quote collections. I’ll share some of mine when I can dig them up. 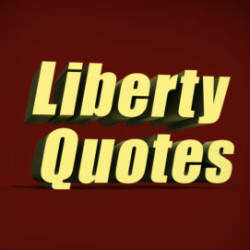 Liberty.me will be publishing a book by Gary Galles this summer called Lines of Liberty, which will be full of them! I expect you’ll like it. “Anarchists did not try to carry out genocide against the Armenians in Turkey; they did not deliberately starve millions of Ukrainians; they did not create a system of death camps to kill Jews, gypsies, and Slavs in Europe; they did not fire-bomb scores of large German and Japanese cities and drop nuclear bombs on two of them; they did not carry out a ‘Great Leap Forward’ that killed scores of millions of Chinese; they did not attempt to kill everybody with any appreciable education in Cambodia; they did not launch one aggressive war after another; they did not implement trade sanctions that killed perhaps 500,000 Iraqi children. This has been a long time favorite of mine. It’s from Henry Ward Beecher. That. Is a great one. We’ll have to start building a database of these.